So I tried a Pinterest recipe this last week. First batch went to the dog, literally. lol. My oven runs hot, and between that and me being a bit distracted, my biscotti cooked to a tooth-breaking hardness. I went ahead and iced it (white chocolate with coconut oil), and Sadie is in heaven! She absolutely loves these! The dough can easily be flattened and cut into shapes if you like, but Sadie is thrilled with the biscotti sticks. 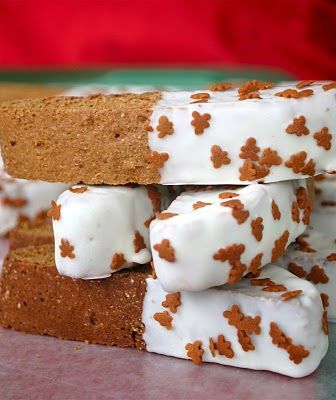 You can change up the recipe for different spices, but the gingerbread is absolutely phenomenal! Plus it's relatively fat-free! So get out your mixing bowl and whip up a couple batches... one for your pup, and one for you (cooked for the proper time, lol!). In a large bowl, mix the brown sugar, applesauce, eggs and molasses. In another bowl mix the flours, baking powder, baking soda, spices and salt. Mix the dry mixture into the wet mixture. It will be dry and mixing with your hands is easiest. Divide the dough into 2 loaves, each loaf being about 4 inches wide and 12 inches long, and about 1 inch tall. Bake on a parchment lined baking sheet for 35 minutes, until the loaves are firm. *If you don’t have parchment paper or a silpat mat, spray non stick spray on a pan. Because there is very little fat in the biscotti, they will stick to a pan without some kind of nonstick base. Remove the loaves from the oven and allow them too cool for about 10 minutes. Slice each loaf diagonally into 1 inch thick slices (take the loaves off the baking sheet and slice them on a cutting board). Put the slices back onto the baking sheet and bake for 15 minutes, then flip the pieces and bake for another 15 minutes. Bake until they are firm ad crunchy. Allow to cool completely before you dip in the white chocolate. Melt 1 package white chocolate chips and then stir in 1 tsp coconut oil. Dip the bottom of each biscotti into the melted chocolate. Cool on a piece of parchment paper. It will take them about an hour to cool completely. NUTRITION INFO: per biscotti (makes 24): 101 calories, 2g protein, 22g carb, 1g fat, 1g fiber, 61mg sodium, 9g sugar. Note: I used King Arthur flours, all unbleached and unbromated. I also wanted my chocolate to set faster, so I stuck the baking sheets in the fridge for 20 minutes. ;-) I'm impatient. As far as flour goes... if you need gluten free, try the King Arthur baking mix - just eliminate the baking soda and baking powder from the recipe. Didn't they turn out great?? They're so good, too!!! OMG! Yummy for us and Sadie! "YES!! You absolutely CAN transform your life!"